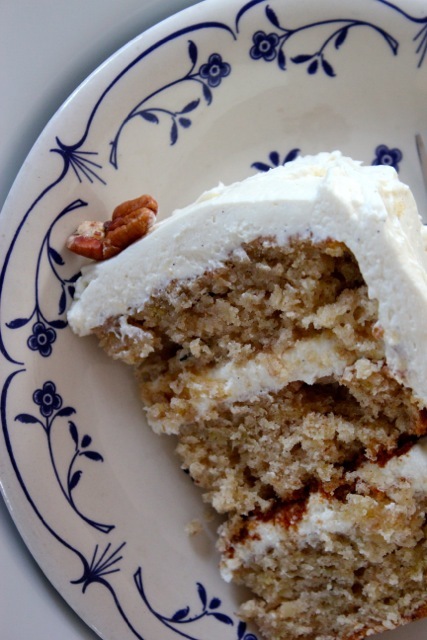 Hummingbird Cake is such a lovely name for a cake. The roasting of the bananas gives it the most mellow of flavors, sugary, rich and delicious. 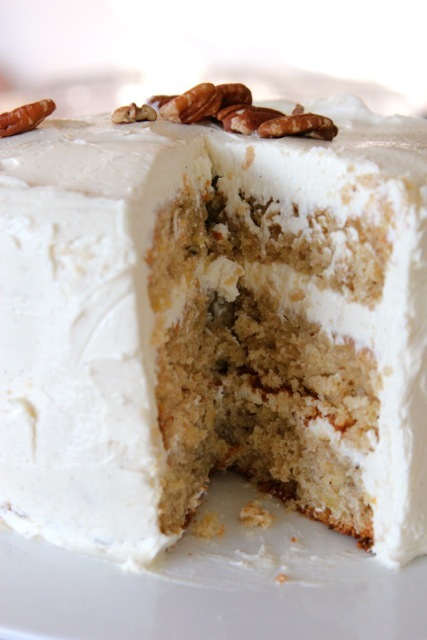 Its origins are in the deep South of the USA, full of chopped pecans, crushed pineapple, and bananas frosted with a delicious cream cheese icing. This is a cake for a crowd or a celebration. A winter cake that reminds you of the summer months to come. *First roast the bananas in a moderate oven preheated to 180°C, 350°F, gas mark 4. Place them on a lined baking sheet with there skins left on. Bake in the oven for 12 – 15 minutes until the skins are black (the bananas will leak out some juice, this is perfectly OK). Remove from the oven and let them cool until they can be handled. Peel the bananas and mash the flesh in a small mixing bowl. Set aside. Leave the oven heated to 180°C. Butter and flour 3 x 9″ round baking pans. Line the bottoms of each pan with parchment paper. Sift flour, cinnamon, baking soda and salt together into a bowl and set aside. In a second mixing bowl combine the granulated and brown sugar. Add the eggs and stir briskly by hand into a smooth mixture. Whisk the oil and vanilla into the sugar and egg mixture until smooth. Add the flour mixture all at once and fold to combine the mixture fully. Add the crushed pineapple, mashed banana and the pecans. Stir just until combined, be careful not to over stir. Divide the cake batter evenly between the three pans and place in the oven for 30 – 40 minutes until cake bounces back to the touch and a toothpick inserted in the cake comes out clean. Leave to cool in the pans for 5 minutes then turn out onto cooling racks, peel off the parchment paper and allow to fully cool before frosting. Cube the butter and place in the bowl of a standing mixer. Beat on low speed, gradually increasing speed to medium until the butter is still cool but has softened together (about 3 minutes). Add the vanilla, lemon zest and slowly add the sifted powdered sugar. Beat until well blended, increasing speed to beat on medium-high for 3 minutes or until the frosting becomes light and fluffy. Place the first layer of cake upside down (the bottom of the cake will be frosted) on the serving plate. Cover with a thin layer of frosting. Place the second layer of cake right side up (flat cake bottom onto the frosting) and frost the top of this layer. Place the last cake layer with cake right side up and use the remaining frosting to cover top of cake and the sides. 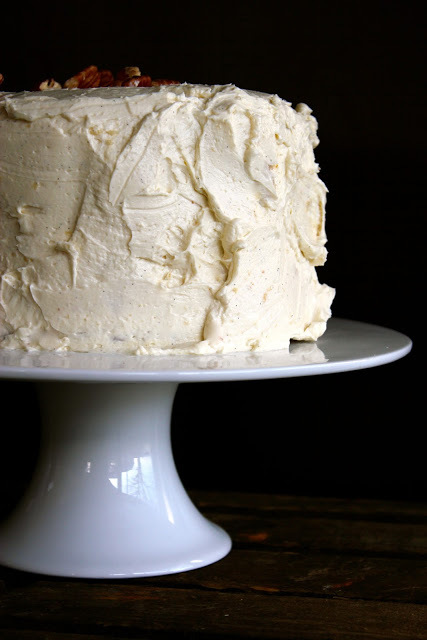 Allow the cake to stand at room temperature for a while before serving and store any uneaten cake in the refrigerator. This cake is a little bit nicer when made the day before you want to serve it. I didn’t know hummingbird was a type of cake… only know it as the name of a bakery. Looks beautiful! This is such a perfect party cake. I have always wanted to make a triple layer sponge cake and I love the idea of roasting the bananas to intensify the flavour. New to me! This sounds like such a lovely recipe and it isnt one I have ever heard before. Now I just have to wait to have a big crowd over! Your frosting is perfect and I love the way you’ve decorated it! I love this cake, a real favourite and keeps well too. Wow! this is some cake! Wondering if you can use tiger banana aka spotty banana or do they have to be greenish? I have the said bakery’s books but was unaware of the cake until recently also. It seems to have it’s roots in Jamaica. I wonder If the Hummingbird Bakery is named after the cake? It is best with the over-ripe sort of banana and a good way of using up a glut for a fruit bowl clear out. Wow, amazing cake Anne Marie. I would never have thought of roasting the bananas first. I wonder if we ever get BBQ weather, I think I might try BBQ bananas, it might add something extra to the flavour. Wow, that cake looks good. I made a carrot cake this weekend that knocked my socks off. Must try this one next. perfect i always to have some lurking from the fruit bowl! I would love a slice of this cake right now. It looks and sounds amazing. I love any cake with lots of frosting! Can I skip the pineapple? If I do – do I need a substitution?